What’s New in Fortnite Season 8? On February 28 at 2 am EST, Fortnite got a new season. Season 8 for Fortnite has officially begun. The theme seems to be pirates with the official theme from epic being “X marks the spot”. There are around 100 items to be earned from the battle pass. Some of the skins include a banana, a pirate and what looks like a female Indiana Jones. There are also some gameplay changes. The planes, golf carts, sneaky snowman, shopping carts and chiller grenades have all been vaulted. Cannons have been added that can either be used to launch people across the map, or as a weapon. 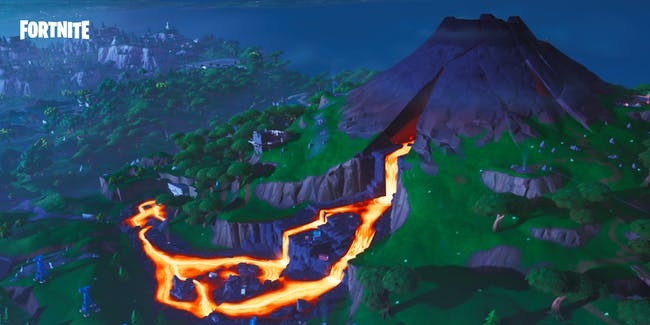 A volcano has also been added that is taking the place of Tomato Temple, Lazy Links, and Wailing Woods. The volcanoes have added vents into the map that will launch players into the air and allow them to reuse their gliders. Risky Reels has been added back and two new locations have been added: Lazy Lagoon and Sunny Steps. The tier 100 skin is what looks like to be a female rapper with chains and tattoos. The skin is called “Luxe” and many players think it’s not really a tier 100 skin compared to past seasons. The price this season is 950 V-Bucks; it’s been the same since season 2. With many people claiming that Fortnite is “dying” it will be interesting to see what changes Epic Games will make to keep the game fresh. To wrap it up, Fortnite season 8 is a refreshing change that has left many players satisfied. But I wanted to know what FCS thinks. First I interviewed Kyle Brady in 8th grade. He said it’s “good but with nothing game-changing except the volcano.” Kyle started playing in season 2. Kyle also thinks the game is dying and needs to add something like the cube event. Next I interviewed Solomon Murphy, also in 8th grade. He said, “It’s pretty good. The battle pass isn’t the best ever. The tier 100 skin is horrible; the tier 1 skin is better. The volcano is lit ’cause you can use it to travel with it. Keeping Frosty Flights was a bad decision because they took out planes.” Solomon started in season 7. Be the first to comment on "What’s New in Fortnite Season 8?"